Nooleys was a well established restaurant in the Nashville area that was getting ready to take its product to the marketplace in the form of frozen entrees. The owner, Al Leblanc, a native Orleans and Cajun food afficianado came to us to take his small location and amplify the brand to accentuate both the restaurant and the new food items. Because the restaurant had been developed as a type of ajun Meat-and-Three with very little signage, we had a completely wide open opportunity to craft the brand in any way we chose. We began by understanding the Cajun/bayou lifestyle, creating a concept board that reflected not only all things Cajun, but also the colors of the bayou and the consistency of the foliage. We knew that we wanted to create a concept with a crawfish lounging in a boat so we started with a rough sketch to create the general theme. Thankfully we have had an ex-Disney artist on staff, who took the rough sketch and turned it into an illustrative work of art. From there we had to determine the rest of the color palette. We decided we wanted the boat resting on water just before sunset, to give it that nice bayou glow, and to take away from the swampy type look - something not very appealing to the food market. The font for Nooleys had to be custom created, and we knew we wanted something fun, energetic, and little kitchy to go with illustration. We created a slab serif font without any particular nod to any one typeface, adding more uniqueness to the brand. With the color palette in place and the font determined, we put it all together, adding a border around the logo to make it easier to see on the product packaging. The final logo features a great color palette, a unique and custom look and a great illustration that blends seamlessly into the brand. 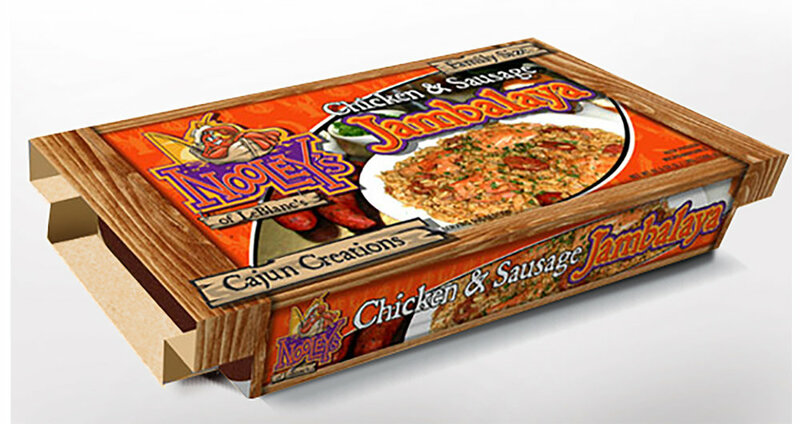 The final product packaging adds even more depth to the bayou theme, creating an old wooden crate for the border of the product. We also added in some complimentary orange colors to make the logo stand out even stronger on the box.